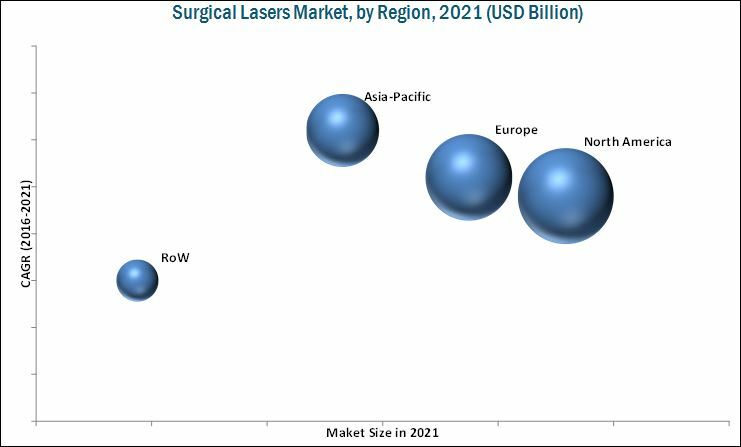 [166 Pages Report] The surgical lasers market is expected to reach USD 2.37 Billion by 2021 from USD 1.85 Billion in 2016; growing at a CAGR of 5.1% during the forecast period. Increasing prevalence of chronic diseases, technological advancements in surgical lasers, increasing incidence and prevalence of targeted diseases, and high prevalence of ophthalmic disorders are the major factors driving the growth of this market. In addition, growing preference for minimally invasive surgeries are further adding to the growth prospects of this market. Emerging markets such as India, China, Brazil, and Mexico offer significant growth opportunities for players operating in the surgical lasers market. This growth in these regions can be attributed to factors such as rising geriatric population, prevalence of lifestyle disorders, and increasing investments by leading players in these countries. A combination of bottom-up and top-down approaches was used to calculate the sizes and growth rates of the market and its subsegments. All percentage shares, splits, and breakdowns were determined using secondary sources and verified through primary sources. In this research study, all possible parameters that affect this market have been accounted for, viewed in extensive detail, verified through primary research, and analyzed to get the final quantitative & qualitative data. Primary interviews with key opinion leaders were also used to determine the percentage shares of each product in emerging nations. The report provides qualitative insights about growth rates and market drivers for all subsegments. It maps market sizes and growth rates for each subsegment and identifies segments poised for rapid growth in each geographic region. Lumenis (Israel), Cynosure, Inc. (U.S.), Alma Lasers (Israel), Abbott Laboratories, Inc., (U.S.), Boston Scientific Corporation (U.S.), IPG Photonics Corporation (U.S.), Spectranetics Corporation (U.S.), Biolitec AG (Austria), Fotona d.o.o. (Slovenia), and BISON MEDICAL Co., Ltd. (South Korea) are some of the key players in the surgical lasers market. The global surgical lasers market is projected to reach USD 2.37 Billion by 2021 from USD 1.85 Billion in 2016; growing at a CAGR of 5.1% during 2016-2021. The rising demand for surgical lasers can be attributed to the growing prevalence of chronic diseases, technological advancements, increasing incidence and prevalence of targeted diseases, and high prevalence of ophthalmic disorders. In addition, growing preference for minimally invasive surgeries among patients and healthcare professionals is supporting the growth of the market. On the basis of type, the market is categorized into five segments, namely, carbon dioxide (CO2) lasers, argon lasers, Nd:YAG lasers, diode lasers, and other surgical lasers (fiber lasers, dye lasers, Er:YAG lasers, and excimer lasers). The CO2 lasers segment is at the highest CAGR in the market due to the widespread availability of innovative CO2-based surgical lasers and ongoing technological advancements in cosmetic laser treatment. By procedure type, the market is segmented into open surgery, laparoscopic surgery, and percutaneous surgery. The laparoscopic surgery segment is expected to dominate the market. This growth can be attributed to the procedural benefits of laparoscopic procedures, growing patient awareness, and market demand for less-invasive disease therapies. Based application, the market is segmented into ophthalmology, dentistry, dermatology, cardiology, gynecology, urology, oncology, and other applications (liposuction, ENT, and GIT). The urology segment is expected to be the fastest-growing surgical laser application in the market. Growth in this application segment is mainly due to the rising prevalence of urological disorders (such as kidney stones, renal cancer, and prostate enlargement), growing patient preference for minimally invasive urological surgeries, and ongoing technological advancements in surgical laser products. On the basis of region, the market is segmented into four regions, namely, North America, Europe, Asia-Pacific, and the Rest of the World. In 2016, North America is estimated to dominate the global surgical lasers market. Factors such as the use of novel surgical technologies among healthcare professionals (owing to the growing number of clinical trials and significant medical reimbursement available in the U.S. for laser-assisted surgical procedures) and a large number of cosmetic laser equipment manufacturers in the region enabled the growth of this market. The Asia-Pacific market is expected to grow at the highest CAGR during the forecast period. The growth opportunities in the Asia-Pacific region can be attributed to the increasing aging population, rising prevalence of targeted diseases such as cardiovascular diseases and cancer, and a huge patient population. Product launches, product enhancements, and approvals were the primary growth strategies adopted by major players to expand their product portfolio in the global market. Several market players also adopted strategies such as acquisition and agreements to expand their presence and increase their visibility in the market. As of 2015, Lumenis (Israel), Cynosure, Inc. (U.S.), Alma Lasers (Israel), Abbott Laboratories, Inc., (U.S.), Boston Scientific Corporation (U.S.) IPG Photonics Corporation (U.S.), Spectranetics Corporation (U.S.), Biolitec AG (Austria), Fotona d.o.o. (Slovenia), and BISON MEDICAL Co., Ltd. (South Korea) were some of the key players operating in the global surgical lasers market. 12.10 Bison Medical Co., Ltd.